Arms in the air, people! Ango just busted in, ready to transform the way you play with paper! James Fritzler has produced this incredible transforming paper toy, and has again made Poplocks do new and interesting things! Ango's head can be tucked down into his torso (like a turtle). Position the arms and legs just right to put him into flight mode. Check out the Netroids Universe to download your PDF copy of Ango. Check out the Ango photo gallery to see what this bot can do! 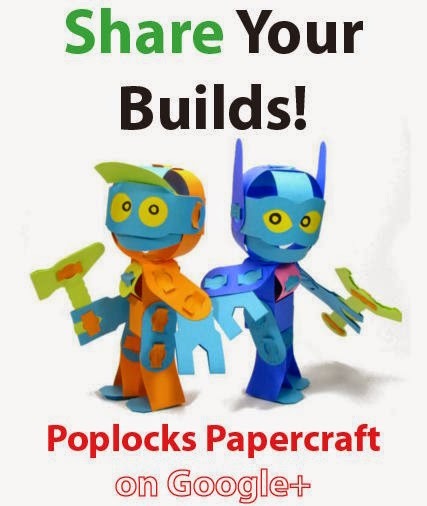 Learn about Poplocks, the free-to-make paper building system! Need help? Do you want to commission a design? Head over to the Contact Page to learn more. Characters and templates by Josh Buczynski are licensed to you under a Creative Commons Attribution-Noncommercial-Share Alike 3.0 United States License. Feel free to modify and share your changes for any specific template, but don't forget to mention where you got the original design!